When one carries a firearm for self-defense, if it is needed most likely that time will be in low or very little light. Being a prudent pistolero you should be able to identify your target before engaging it. To help do this a light is needed. One of the if not the best is Surefire/Laser Products. 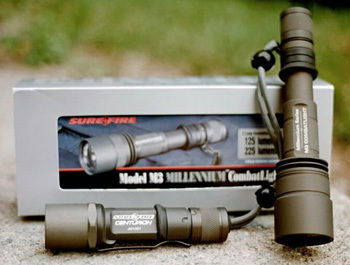 New for 2000 are the M2 Centurion and the M3 Combat Light. The Centurion has an octagonal light bezel so the light won’t roll away when you set it down and a built in pocket clip for easy carry. The lens is a clear pyrex to keep it from melting. The light also comes with two light bulb units to give added flexibility. Unit A is the original style light an puts out 65 lumens which will put out enough light for most situations. Light B puts out 120 lumens and will light up the drive way or garage, major drawback is Light B consumes those lithium batteries. For those need a little more light the M3 Combat light will fit the bill. This light like the Centurion is mad from aircraft aluminum for toughness. Where the Centurion stops at light power the M3 picks up. It has the new light unit as its primary light source and this can be changed out for a more powerful source that comes with it that produces 220 lumens, more than enough light to light the back yard. This light can also be used as a less than lethal weapon with the 220 lumen bulb as it will temporarily blind you. Both light come with the Z series O-ring to aid in using the Rodgers/Surefire syringe technique of shooting a handgun with a light. The lights are also well suited for the Harries Technique. Both are taught at most of the institutes of higher handgun education, try them and use works for you. Because of size the M3 light makes an excellent duty/field light. The Centurion would serve well at home, on the person, or at Gunsite learning how to properly use that 1911. Check out the web page at www.surefire.com for more details.